If you’re a Douglas Adams fan, you’ll know that the only way to end that line is with ” … for all the fish”. Although no one has actually given me any fish, so long and thanks for all the page views doesn’t really have the same ring to it. So I think I’ll go with this. If I’m very disciplined, I might manage to keep my ‘So Long’ post under 300 words. Let’s see how I go. I’m working on a young adult novel at the moment. It needs to be somewhere around 60,000 words. Maybe 70,000 max. I knew this when I started writing it but that hasn’t stopped me writing over 100,000 words. And in some ways I’m still looking for the story. But that’s okay. That’s how I do things. Somewhere in the middle of all the noise, I eventually find the stuff I need. I hope that somewhere in the middle of the noise I’ve made this month, there were a few bits and pieces of interest to you guys reading along. Thanks to all of you who have been reading. And thanks especially to Tierney and Ella, for keeping me company in the comments section, and giving me the opportunity to ramble even more. If you’re interested in keeping up with what’s going on for me, I blog from time to time here: As In Egg. However, I am a bad blogger, and often forget to add images. And sometimes words. If I’m busy, I have been known to abandon the blog for months at a time. It’s just how things work. Despite being a bad blogger, I’m also running another blog at the moment. It’s called Ten Tiny Things, after a picture book I recently published with street artist Kyle Hughes-Odgers. It’s a place for secret somethings and hidden happenings and we’d love to have some submissions from New Zealand. One of the questions writers are often asked is where they get their ideas. It’s a perfectly good question but it’s also one I find perplexing. Because getting ideas is not my problem. If anything, my problem is having too many ideas. I think that once you open your eyes to what’s around you, there are stories absolutely everywhere. I mentioned earlier that Surface Tension began with the image of a drowned town. But I also said that the image slept in the back of my mind for over 25 years. Because an image is not a story. Even an idea is not a story. For me, there’s a kind of collision that needs to happen before that initial spark of something begins to turn into a story – a sort of bumping together of two or more little fragments. In Surface Tension, the image of the drowned town somehow bumped against a character idea I had. I was reading a book called The Member of the Wedding, by one of my favourite writers, Carson McCullers. In the book, a girl called Frankie has an older sister who’s getting married, and somehow Frankie convinces herself that she’ll be going with her sister after the wedding, which of course isn’t the case. I started thinking about a character who was a ‘late baby’, born years after her older siblings, and who feels disconnected from their family history, all the stories that were made before she came along. Somehow that idea bumped up against the ‘drowned town’ image. I started wondering about a girl who not only missed the making of her family history, but also the place in which it was made. Maybe they lived in the town that got flooded? Maybe she never did and is now haunted by that idea. Ooh. What if she was born on the day it was flooded and that’s why she feels so connected to it? That’s where that story started. I can’t tell you why those two ideas connected in the way they did – that’s a mysterious part of the process that I often don’t quite understand. But I do love how it works. A couple of the Lightning Strikes Books I mentioned in my last post came together in similar ways. An assembly I went to at my daughter’s primary school. There was a boy who had won a merit award for neat handwriting, who looked like he’d much rather have the shiny trophy a Year 7 kid had won for BMX bikeriding. Looking through old photos and remembering my older brother’s attempts to break a world record when we were kids. Once those two things had come together, the story began to form. seeing my house on Google Maps and thinking it would be funny if something weird/embarrassing had been happening when the photo was taken, which would then be on the Internet for everyone to see. knowing some people who moved, without realising, into a street where everyone goes all-out with their Christmas lights. For me, ideas are easy. I collect them every day and jot them down into notebooks. And then I wait. I never say, I think I’ll work on this idea now. Okay, what can I write about? and I don’t say What if …? as I know some writers do. I just wait for an idea to join up with something else and push its way to the surface of my mind. Once it has a momentum and an energy of its own, once the story starts taking off by itself and I can’t stop thinking about it – that’s when I know it’s time to sit down and get cracking, to do the hard work of trying to find a narrative shape for it. And that’s when my problems really start! Snarked is a great comic book for people 6 to 66 and is written by New Zealander Roger Langridge. Winner of the Eisner award for ‘Best Publication For Kids’, it is the first of what will be three volumes. About a walrus and a carpenter that go on an adventure looking for the lost king. My favourite part would have to be when they try to break into the palace and the carpenter mucks everything up. So I said earlier that I’d talk about some of the unexpected places my books have taken me since I started this whole writing thing. And even though my last post was about my work travelling to the US, in this case I’m not talking about geography but something else entirely. When I started writing, it was in tiny fragments. I’m a bit like a magpie and love to gather bits and pieces of observation – images that strike me, interesting sentences, snippets of overheard dialogue. I come to both reading and writing via poetry and am generally more interested in image and idea than in plot and action. So it’s been a surprise to me that I’ve found myself from time to time writing books that are entirely plot-driven, that are all about hooking the reader and keeping the pace moving, where there isn’t really much time for savouring turns of phrase or wry, sideways observations about life. The thing is, I’m a fairly serious person. I spend a lot of time taking things very seriously indeed. But years ago, when I was in the trenches trying to get published, I had a mentor read a YA manuscript I was working on. He liked it but he didn’t love it. And when we met in person, he said, “You know, you’re actually pretty funny. Why aren’t you writing funny?” He said he thought perhaps I was too busy trying to be all literary, making sure people knew I was A Serious Writer, and wasn’t letting myself have fun with the writing. It was highly offensive. And also somewhat correct. It was certainly worth thinking about. So years later, when Walker Books asked if I wanted to write something for their new Lightning Strikes series – something fast-paced, plot-driven, full of humour and action and generally stuff happening, I thought, Why not? 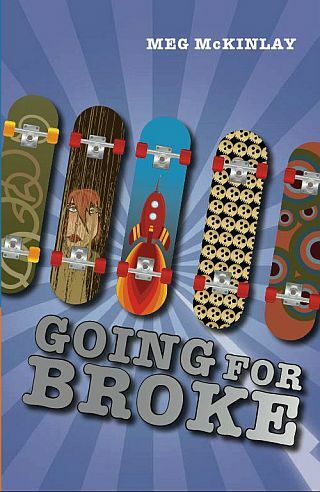 So I wrote Going for Broke, which is about three boys who decide they want to win something more spectacular than a merit award for neat handwriting, and set about trying to break a world record. 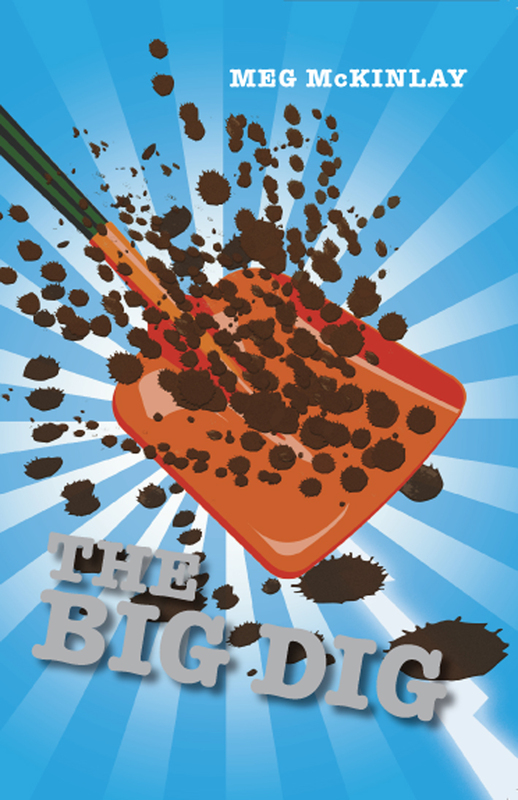 Then I wrote The Big Dig, which is about three boys who decide what they really need is a pool in the backyard, and set about trying to dig one themselves. And then I wrote Wreck the Halls, which is about three boys (you may be sensing a pattern here, astute reader) who decide they need some cash for a specific reason, and the only way to get this is to win the local Christmas lights decorating competition. 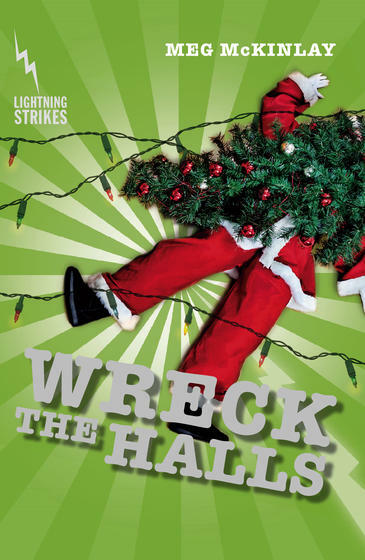 Wreck the Halls is my newest book, out just this month. It’s not the kind of book I ever thought I’d write; it’s a place my writing has taken me that I never thought I’d go. These books have been very challenging for me because I like to ramble. I like to play with words and ideas and set plot aside and go on and on and on (you may have noticed some evidence of this in my blogging style …). But there’s no room for that here. So these have been great, because they’ve taught me things: about pacing and plotting and writing with a strong narrative hook, and how sometimes – often – less can be more. All of these things have fed usefully back into my other writing, which is, of course, Far More Serious. I think I’m finished writing this kind of book now. I don’t really have any more of this sort of idea and there are other stories pulling on me more insistently. But I’m very glad I did it. Not only did these books teach me things, but they were lots of fun to write. I can only hope they’re lots of fun to read. In my last post, I mentioned that Surface Tension will be released early next year in the US, with a new cover and a new title. This will be the third of my books to come out over there and people are often curious about how that process works, what sort of changes are needed and so on. So I thought I might talk a bit about how it’s worked for me. 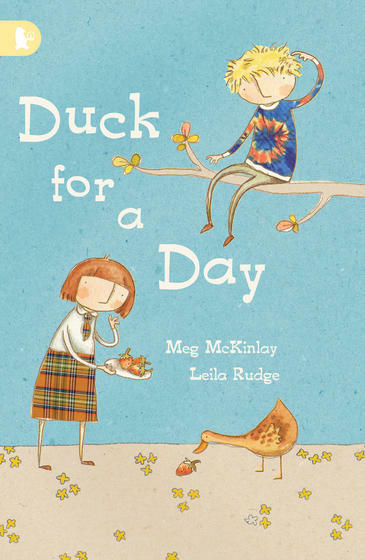 In Duck for a Day, there is a gum tree which is important to the story. The US editor said their readers wouldn’t understand ‘gum tree’ and suggested we change it to ‘eucalyptus tree’. I thought that would sound strange – too specific or something, and it would also be constantly saying, Hey, kids, this is in Australia!, which isn’t really relevant to the story. I suggested we simply change it to ‘tree’ so kids would read ‘past’ it, and that’s what we did. In Surface Tension, there was confusion over the ‘house system’ used for school sports. The editor was curious as to how Liam and Cassie could be in the same class but in different houses. I was confused by her confusion. It took a while for us to work out what the other was confused about. Then we still had to solve the problem in the text. The 4WDs and utes in Surface Tension all became trucks, something I find very amusing, given the image ‘truck’ conjures up here. There was much debate over whether ‘toilet’ should be ‘restroom’ or ‘bathroom’. It absolutely could not be toilet! In Duck for a Day, Max is not allowed to have strawberry lollies. But the US editor thought that meant lollipops and that was confusing for a while. After we worked out what was going on, we had to decide whether to say taffy or candy or sweets. Luckily I really like messing about with words, so I found this whole process really interesting and fun. 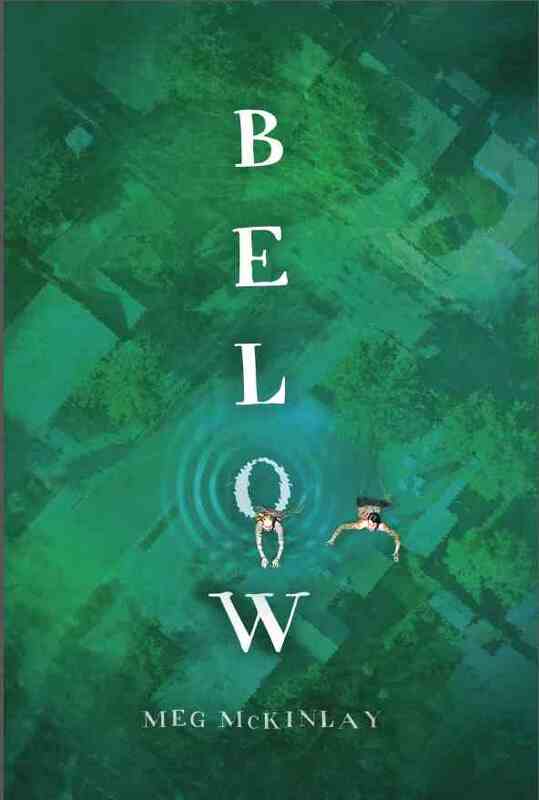 Although Surface Tension became Below, both No Bears and Duck for a Day kept their original titles, and No Bears has the same cover. 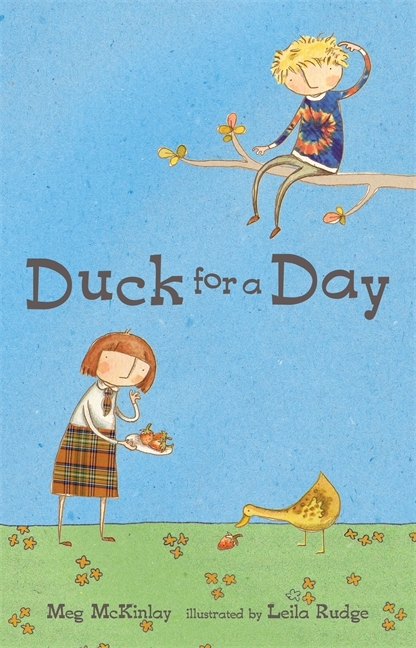 The Duck for a Day cover is almost the same, with a few small changes in colouring and the layout of design elements. Here are the two covers below so you can see what I mean. Here, I think I prefer the Australian cover, on the left. I’m not sure what the reasoning was behind changing it, but it’s not something I feel strongly about so I was fine with it. There is one other interesting change I’m still getting used to. In the Australian edition of No Bears, the main character’s name is Ruby, but the US editor said they had too many Ruby books at the moment. She asked if I would be open to changing the name, and I said yes, but I wanted it to be another name that I loved – something short and strong, with a lot of personality. I chose Ella, and so that’s her name in the US. Which is great, and I have no problem with it, but I still think of her as Ruby, which can get quite confusing sometimes. I occasionally get email from US readers, who say things like I love it when Ella says ABC, or Why doesn’t Ella do XYZ? and I think, Who on earth are they talking about? And then I remember. That Ruby went over the sea and turned into Ella on the way. That my books are over there slightly changed. What is it they say – same, same, but different. I guess that sums it up. If you loved The Traveling Restaurant you have to get your hands on The Queen and the Nobody Boy, but if you haven’t read it this book will make you fall in love with the land of Fontania. In my last post, I talked a bit about where my novel Surface Tension came from. This time, I’m talking about where it’s ended up because something quite curious happened recently and it’s made me think about the unintended places our work can take us. 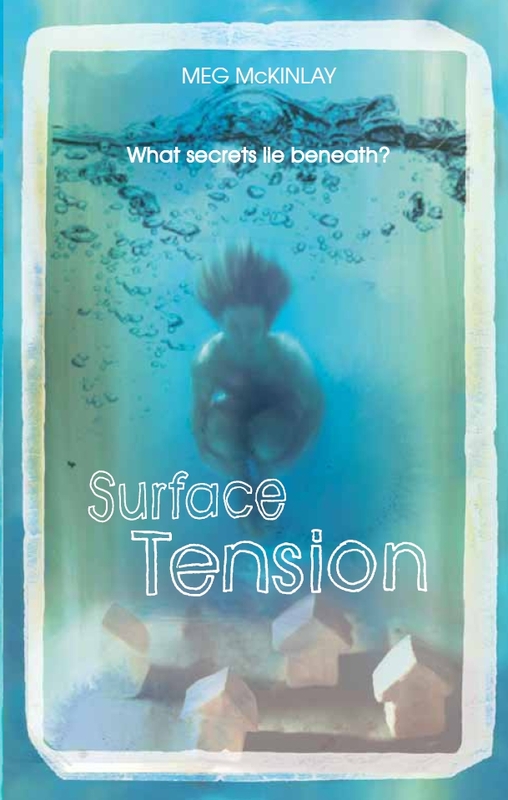 I was very surprised earlier this month to learn that Surface Tension had been judged the winner of the Children’s/Young Adult Fiction category of the Davitt Awards, for crimewriting by Australian women. It’s always surprising to win something, but in this case it was particularly unexpected because I somehow hadn’t realised that Surface Tension was a crime novel. That may sound spectacularly clueless, but I think it’s partly that I was more focused on chasing down the image than on writing a particular sort of story. When I began, I had no idea what sort of plot I was going to shape around the image; that came out of a sort of messy brainstorming process where I found myself thinking about secrets and things being buried or hidden. The other reason is probably that as as writer and a reader I’m more interested in ideas than I am in plot. In Surface Tension, I was less interested in what actually happened – the ‘crime’ or mystery narrative – than I was in the underlying ideas, and for me, those are about history and memory, the way the past is written (and overwritten) and who gets to tell what stories. So I think my eye was on those things and less on the nuts and bolts of the plot itself, and perhaps that’s how I managed to become a crimewriter without really noticing. There are other ways in which my writing has taken me to unexpected places over the last few years and I’m going to talk more about that in another post. But for now, I leave you with two images. Because as we’ve established, all good blog posts require pictures, and also because these represent another place Surface Tension is travelling to – this time a literal place, being the United States, where it will be published early next year by Candlewick Press. The first image is the Australian cover and the second is the US cover. There are some obvious differences between the two and I’d love to hear your thoughts. Does one appeal to you more than the other? Which would you be more likely to pick up off the shelf?